Round strands coil sumptuously with smooth sauces – especially tomato with herbs that cling to the strands as it’s twirled around a fork. Elegant thin varieties complement brothy soups while thicker lengths partner well with heavier sauces. Ribbon-like strands – from wide to narrow – were the first pasta shapes created since they were easily cut by hand from flat sheets of pasta dough. This shape is very versatile and is suitable for a wide range of sauces from seafood, such as clam sauce, to hearty meat sauces like Bolognese and carbonara, as well as creamy sauces like Alfredo. Perfect for both simple and more refined sauces, these shapes are frequently used in pasta salads with oil-based dressing or pesto. Their crevices are ideal for collecting vegetables, herbs and spices. These open-fringed, elegant varieties are ideal for serving with dairy-based sauces like béchamel, chunky meat ragus or even tomato-cream sauces like vodka sauce. 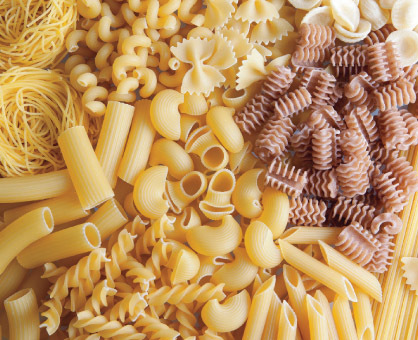 These thicker-shaped pastas pair well with full-flavored sauces. Served hot, their contours are made to hold hearty meat sauces and sauces with chunky ingredients like peas or capers. Ridges, known as rigate, and angular-cut ends offer intriguing texture when served cold in pasta salads. Delicate, compact shapes just right for scooping onto a spoon. These tiniest of shapes are used in soups and broth dishes. Filled with cheese, spinach, vegetables or meat, large hollow pasta shapes partner well with tomato or cream sauce in baked casseroles.